Whitby Town picked up a 1-1 draw against play-off hopefuls Workington, in a much-improved performance from Chris Hardy's side. Kieran Weledji opened the scoring for the Seasiders, before substitute Matthew Douglas headed home at the back post just a minute later. Chris Hardy brought Andrew May and Kieran Weledji for Matty Tymon and the injured James Risbrough into the side, reverting back to the 3-5-2 system that served his side well last season. The Blues could have led early on, too, as they looked to gain the initiative from the outset. Defender-turned-forward Weledji burst into the box, just after the ten minute mark, before being blocked off by Sam Smith. Weledji himself stepped up, but his weak spot-kick was saved with ease by Aaran Taylor. The visitors had attacking intent also, with Scott Allison and Joshua Calvert forcing good saves from Shane Bland in the ten minutes following the penalty. Calvert again forced a good save from the Blues stopper near half-time, firing in an effort at the near post, with Bland palming over. After the break, Whitby looked more dangerous going forward and took the lead, 12 minutes after the restart. Luke Bythway found Weledji with a neat through ball. He took a touch, turned and finished neatly past Taylor, wrong-footing the rooted goalkeeper in the process. Just a minute later, however, the visitors levelled matters, with the Blues switching off at the back. Whitby failed to close down Tinnion's ball into the box, which fizzed across the face of goal and found Douglas lurking, who headed home to ensure a point for his side. 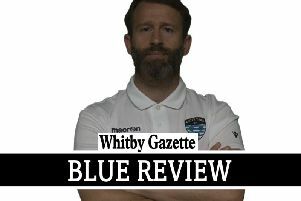 Whitby Town: Bland, Martin, McWilliams, McGoldrick, Bullock, May, Snaith (c), Gell, Weledji (Roberts '90), Bythway (Carson '76), Monkhouse. Subs not used: Hume, Fryatt, Tymon. Workington: Taylor (c), Simpson, Mellen, Wordsworth, Smith (Douglas '46), Wright, Symington, Calvert, Allison, Holt (Joel '57), Tinnion. Subs not used: Ryan, Rowntree, Harker.